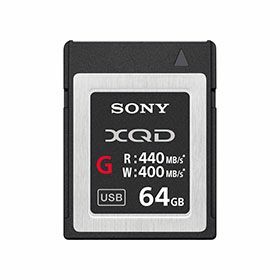 Supporting enhanced data read and write speed, the 64GB XQD G Series Memory Card from Sony can be used to record a variety of content up to and including 4K video. 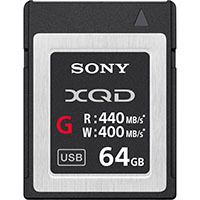 In addition to recording 4K content, the 440 MB/s read and 400 MB/s write speeds make it easy to capture photos in both burst mode and in RAW format, as well as streamline workflows. This XQD G Series Card from Sony also supports both PCI Express Gen. 2 and USB 3.0 interfaces, allowing it to be used with a wide range of devices.